i want to start by reminding everyone that every child is different. they each have their own strengths and weaknesses, and so excel at different things at different times. there is high variation even between my own children. jaden at ten months had an obsession with letters, and that naturally progressed to phonics and then reading. everly on the other hand, had no interest in the alphabet and so i never bothered to teach her letters. she excelled at gross motor skills, so i encouraged that first. because i've received several emails asking for recommendations on toys and resources that helped jaden with reading, i've compiled a short list of jaden's favorites. i really wish that i could take credit for jaden's knack for reading, but i can't. i'm not a tiger mom. i don't believe in drilling my kids with workbooks or forcing them to learn things if it doesn't interest them. with that said, we have a million and one workbooks at our house but only because jaden genuinely enjoys them. again, every kid is different, and this isn't meant to be the formula for reading success. but here i share a few of the things that i think were the stepping stones in building jaden's early reading skills. 01. Animal Flashcards. these flashcards are what started it all. no, there's nothing magical about them. they're just regular cards with really cute illustrations that i bought to teach jaden his animals. but starting at nine months, he showed more interest in the letters on the back than the animals on the front. he would point to a card and i would say the name of the letter. once he knew the whole alphabet, we'd play a game where i would lay out a few cards and ask him to find a specific letter. this was his favorite game for months! 02. Melissa & Doug Chunky ABC Puzzle. this was jaden's favorite toy for over two years. the chunky puzzle pieces are perfect for little hands. we first used the puzzle to identify letters and place them in the correct spots. then, we eventually used it to spell simple words. everly currently loves this puzzle. 03. Leapfrog Letter Factory Phonics. these singing magnet letters were a huge hit with both my kids. it teaches letters and phonic sounds in a fun, interactive way. 04. Leapfrog Letter Factory DVD. we LOVE letter factory! i give full credit to this dvd for creating a love of phonics in jaden. he would get so excited when i turned this on for him and it was what introduced him to the fact that letters don't just have names but also sounds. also, thanks to letter factory, everly has known all her letters and phonics since she was eighteen months. we're not the only ones that love it though. this award winning dvd has 1100+ five star reviews on amazon. 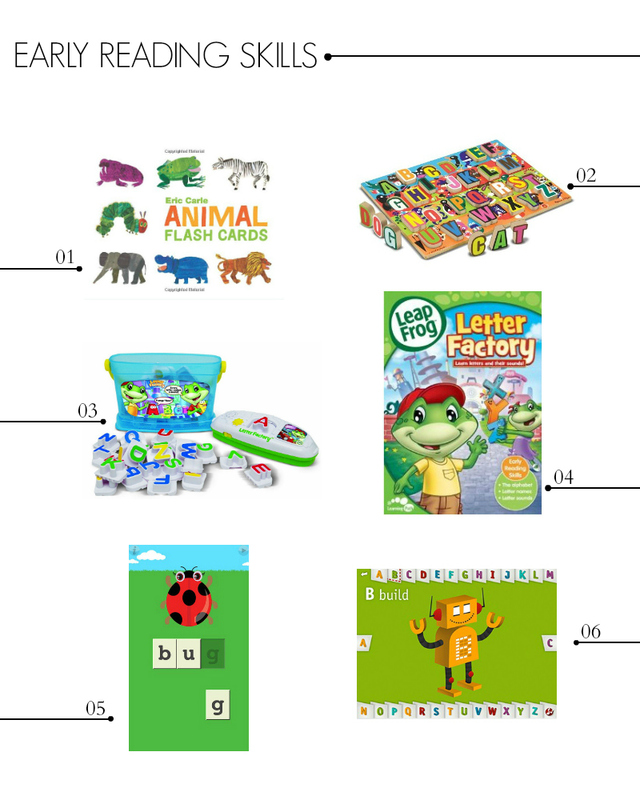 i also recommend leapfrog's Talking Words Factory, which goes over vowels and building simple words. 05. Learning Touch First Words iPad app. this was one of jaden's favorite iPad apps from one to two and a half years old. at fifteen months he was able to drag the letters to the appropriate spots and "spell" the words. when you touch a letter, it says it's name and once all the letters are placed in the appropriate boxes the picture becomes animated. this was a great tool for reinforcing recognition of letters. 06. Spinlight AlphaTots iPad app. both my kids love this app. it's a bit too easy for jaden now at the age of three and a half but i highly recommend it for ages one to three. it's currently everly's favorite app. every letter has a fun activity. so for example, for the letter B, you Build a robot. Or for the letter D, you Dig for treasure. Super fun and engaging! hope this was useful to some of you! happy monday!